No matter how far we roam, there's no adventure that rivals spending time with family. And making a family stop along the route of a road trip is the best. We stopped in Demopolis because it has an interesting history, but mostly to spend some time with nephew David and his family, who moved to the city just this year. We got moving too late to join in their traditional Saturday pancake breakfast, but spent the rest of the morning at their charming home on five acres atop a hill in a rural area seven miles outside of Demopolis. With sparsely placed houses, their hilltop offers an unobstructed 20-mile view. A generous number of oversized windows ensures the view can be enjoyed inside and out. Since we dropped in on them out of the blue, like a toothache that wakes you in the middle of the night, we tried to fit into what they had planned for this Saturday morning, the first day of their Thanksgiving break. Ken helped David perform some troubleshooting on the lawn irrigation system while Tonya drove 15-year-old Andrew, a history buff and Florida football fanatic, to a community service commitment. That left me to play and ride the golf cart around the hilltop with Carson, 13 years old and a sparkling conversationalist, and the irrepressible bundle of energy named Lizzie (age 8). The morning flew by and soon we all piled into the kitchen to toss together a hearty, healthy salad for lunch. After sitting down together to enjoy the meal, the view and each other's company, we took our leave and went off to explore Demopolis. After Napoleon’s defeat at Waterloo in 1815, his most ardent supporters—many of them high-ranking officials—grew concerned about their fate under the restoration of the French monarchy. Some traveled to the United States to seek their fortunes. Welcoming these refugees to America, the US Congress granted them a large tract of rich land in the Alabama Territory on the condition they establish a Mediterranean-style “Vine and Olive” colony. The agricultural project ultimately failed and most of the settlers returned to France or moved to the Francophile cities of Mobile or New Orleans. The few remaining colonists intermarried with other settlers, but the French history of the area can be seen in street names and the few remaining olive trees. GAINESWOOD PLANTATION HOUSE TOOK ALMOST 20 YEARS TO COMPLETE. Our first stop was Gaineswood Plantation house, completed just before the Civil War broke out in Alabama. 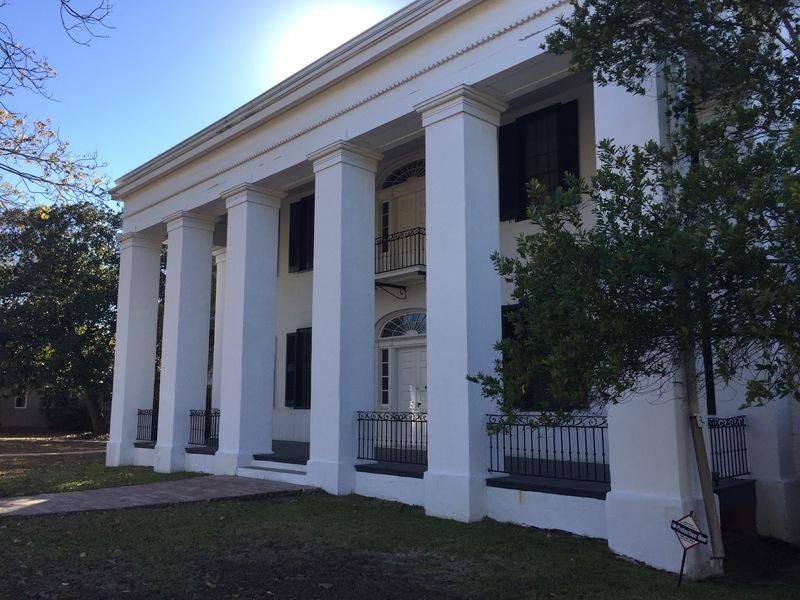 It was the home of a cotton planter and is considered a fine example of Greek Revival architecture, incorporating Doric, Corinthian and Ionic columns. The exterior brick was plastered over with smooth stucco and scored to give the appearance of masonry. And unfortunately, the exterior was all we were able to see as we arrived after the final tour of the day began at 1 p.m.
BLUFF HALL IS OWNED BY THE COUNTY HISTORICAL SOCIETY. We had better luck at Bluff Hall, another antebellum estate, situated on a chalk bluff overlooking the Tombigbee River. The house was built in 1832 by planter Allen Glover as a wedding gift for one of his daughters. Mary, a friendly docent for the Marengo County Historical Society, greeted us and welcomed us to the 2:00 tour. She told us and another couple about the early history of the house and its owners, then allowed us to explore on our own. BLUFF HALL IS FILLED WITH ARTFULLY ARRANGED ANTIQUES. When we were ready to leave, we walked to the front door just in time to hear a key turning in the door lock. Mary thought we had already left and was securing the house for the day. If our timing had been a minute later, we might have had the opportunity to test out one of the 19th century beds. FISHERMEN TURNED OUT FOR THE TOURNAMENT. Before leaving town and heading west, we stopped at the Demopolis City Landing to check out the confluence of the Black Warrior and the Tombigbee Rivers at the northern edge of town. When we arrived, the parking lot was alive with anglers getting their catches weighed for the River City Bass Masters Club Classic Tournament. A prize of $2,000 was at stake, so excitement was in the air—at least for those with weighty hauls. From the landing, we returned to our old friend US-80 and drove into the sunset and Mississippi. The end of our journey Saturday was Meridian, Mississippi (pop. 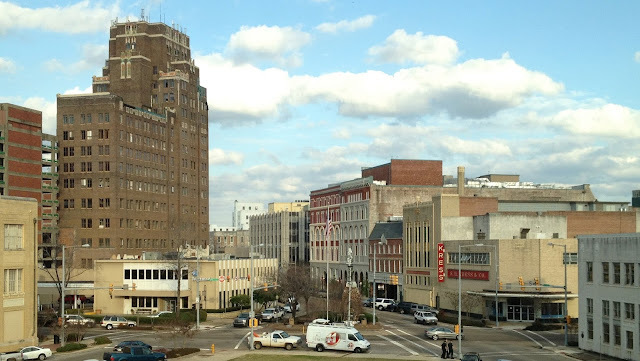 40,921), the sixth largest city in the state. Established in 1860 at the strategic intersection of two important railroads, Meridian grew quickly as a center of trade and transport. A Confederate arsenal and POW stockade made the city a tempting target for Union forces during the Civil War, and as he did in Atlanta, General Sherman destroyed Meridian's railroads and burned much of the city to the ground. Today the city's diversified economy relies on two military installations, manufacturing and healthcare operations. Increasingly culturally diverse, Meridian has become home to a lively arts and music scene. On Sunday, we enjoyed our first Time Out Day. We decided to institute this practice once a week—usually on Sundays, for a variety of reasons—to give ourselves a break from our road trip routine. No to sightseeing, driving, and letterboxing. Yes to laundry, regrouping, and relaxing. So far, we like it a lot! Tomorrow we plan to continue west on US-80, crossing the Mississippi River into Louisiana. Loved: Spending the morning with David and Tonya and their terrific kids. Lacking: Letterboxes—none anywhere along our route today. Learned: We had no idea that Bonapartists had sought refuge along the banks of the Tombigbee River and tried to grow grapes and olives. Our duck release in Alabama was Moby Duck. He set sail on the Tombigbee River from the Demopolis City Landing. Wisely he waited until the end of the tourney so he wouldn't get hooked by a fisherman. If nothing happens along the way, he'll end up in the Mobile River and into Mobile Bay before chugging into the Gulf of Mexico. GAINESWOOD'S LANE OF CREPE MYRTLES OFFERS ITS ONLY LANDSCAPING. BUILT IN 1878 BY JOHN C. WEBB, THIS DEMOPOLIS HOME IS STILL IN THE WEBB FAMILY.